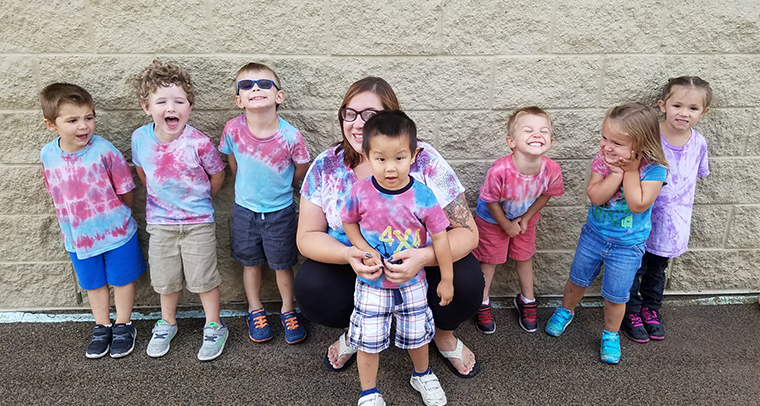 The philosophy of the Sheboygan County YMCA Child Care Centers is to develop each child’s spirit, mind and body through Christian principles and character development. Our goal is to provide a warm, relaxed, home-like atmosphere in which children can grow and develop. We are committed to the social, emotional, cognitive and physical development of children. They will actively participate in age-appropriate, hands-on learning activities which will create memorable experiences for the children. All lessons are based on the Wisconsin Model Early Learning Standards. The written curriculum for each week is posted on a bulletin board in each classroom. It includes the main events for each day, including weekly topics. The topics for the different age groups are the same each week. The time spent discussing the topic and the language, vocabulary, depth and activities used may vary according to the group’s age and ability. There is also a weekly list of skills that are being introduced or reviewed posted on the bulletin board directly outside the entrance to the center. The Sheboygan YMCA uses the HighScope curriculum as well as theme-based units for preschool lessons. The lead teacher plans all preschool lessons and all teachers implement them. Lessons are differentiated based on age and ability. Encourage self-esteem, develop positive self-image. Activities include warm staff and child interactions, challenging developmental materials, consistent daily routine, interesting and diverse activities, positive adult/child and child/child communication and stressing that each child is valued for individual achievements. Program activities include creative play, group time, mealtime interaction, community programs and field trips, planned family activities, teacher and child initiated activities and music, song and dramatic play. Activities for preschool participants include group story time, acting out stories and plays, making books readily available, show-and-tell, creative play experiences and other teacher/child initiated activities. Activities for school age participants include group activities, storytelling, board games, arts and crafts and other teacher/child initiated activities. Activities include providing creative art materials and play equipment, using constructive toys and experiencing the fine arts through the use of community resources. Large muscle development includes group activities, sports, using playground equipment and offering classes at YMCA facilities. Small muscle development is enhanced through the use of puzzles, beads, creative art experience, finger play games and more. Our educational philosophy is designed to focus on the creative, emotional, intellectual, physical and social growth of each individual child. The purpose of our approach is to foster competency in the young child. While the emphasis is on children, family involvement is encouraged and supported. A tour with the childcare director is required for enrollment. The director is available Monday - Friday by appointment for center visits. Enrollment packets may only be received from the center director. A parent must have the director’s permission to enroll a child. Initial registration with applicable fees needs to be completed with the child care director and/or office manager. Enrollment forms must be returned to the center prior to your child’s first day of attendance. Children will not be allowed to stay at the facility without all of the emergency information completed.